AccuTemp Mechanical Is Proud to Be a Local Kenosha Area Business! Our team of highly skilled HVAC, piping, and refrigeration technicians, as well as our office support staff, care about the Kenosha community—after all, it’s our home. 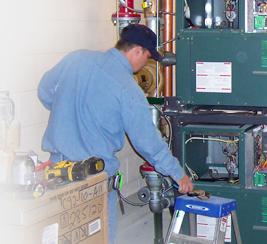 From 24-hour emergency HVAC service to new installation, we’re here when your mechanical systems need attention. We serve a wide variety of industries throughout Kenosha, from data centers to factory facilities. With our highly competitive rates, you can’t afford not to give us a try. Contact us today and see what we can do for your business and your bottom line. Our parent company, Reedy Industries, is a high-growth HVAC services company that transforms our industry through extraordinary people, unique customer-centered solutions, and unprecedented results. To learn more about career opportunities at Reedy Industries, or AccuTemp Mechanical, please visit reedyindustries.com.